A two-time Olympian made the podium on day one of the UIPM 2018 World Biathle/Triathle Championships but it was two athletes from the Czech Republic who stood on top of it. Eliska Pribylova and Ondrej Svechota teamed up to win gold in the Biathle Mixed Relay, with Lushano Adendorff Smit and Tiaan Rossouw of South Africa claiming silver. A familiar face from the pentathlon community joined them on the medal rostrum as Dmytro Kirpulyanskyy, an individual World Championship bronze medallist who competed at the Beijing 2008 and London 2012 Olympics, joined forces with Zinayida Batrak to win bronze for Ukraine. Senior success for the Czechs and South Africans followed a reverse result in the Junior category, where Tara Schwulst and Dylan Matthew Kruger (RSA) won gold ahead of Veronika Novotna and Martin Vlach (CZE). In the youth categories, there were another three gold medals for South Africa as well as one each for host nation Egypt, Great Britain and Kazakhstan. In three Masters categories there were titles for Great Britain, Spain and South Africa. The first-day haul of five gold medals suggested another successful championships in store for South Africa, who took home an incredible 42 golds from the 2017 event in Viveiro (ESP). 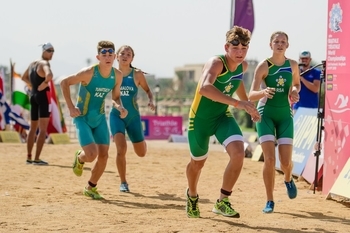 Also on day one, four Triathle Mixed Relay titles were decided at youth level, with Great Britain winning two and one each for Egypt and South Africa. Visit the UIPM website for detailed results from day one. The UIPM 2018 World Biathle/Triathle Championships runs from October 25-28 with the rest of the Triathle Mixed Relay competition taking place on October 29.